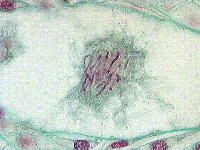 Early prophase I in the megasporocyte. 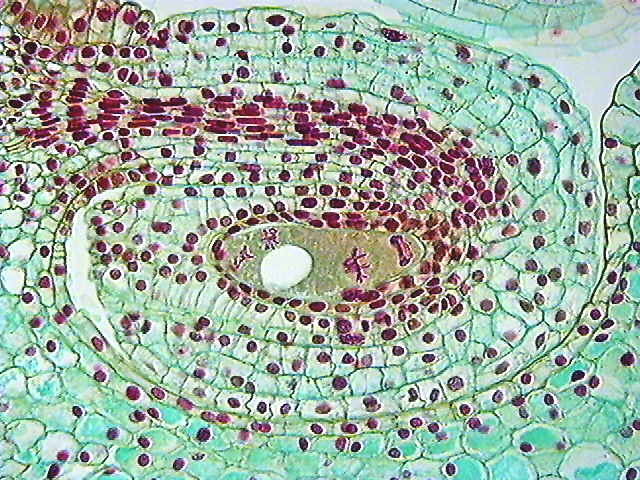 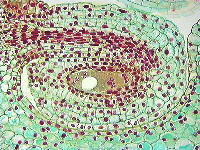 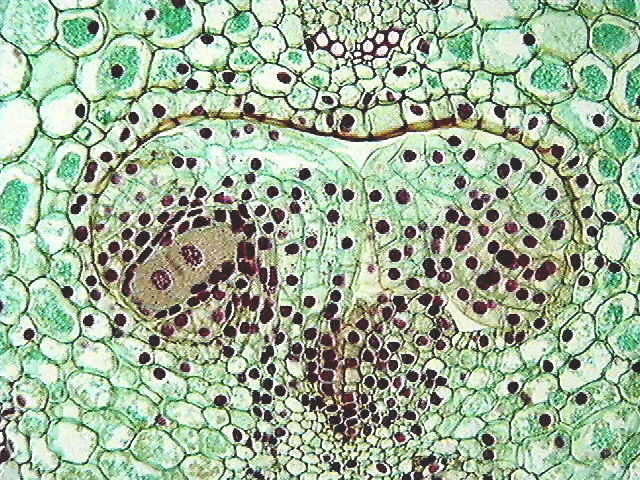 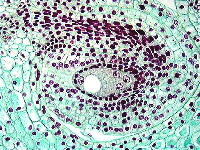 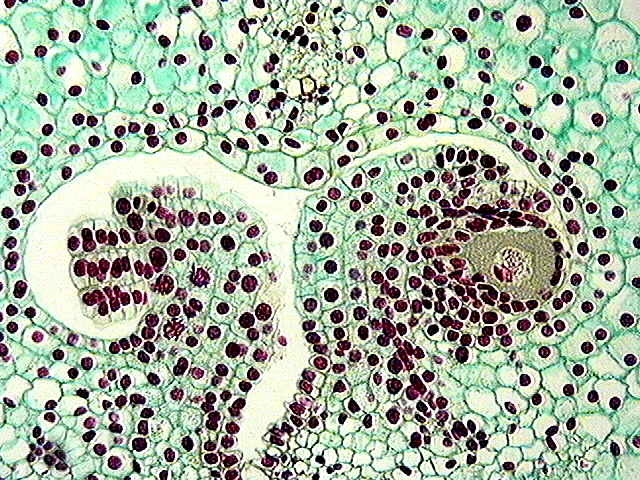 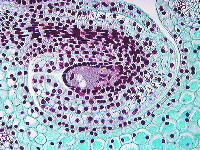 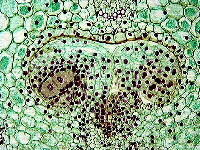 The parallel stripes in the cytoplasm are layers of endoplasmic reticulum. Initially, the nucleolus is prominent and centrally located. Mid prophase I in the megasporocyte. 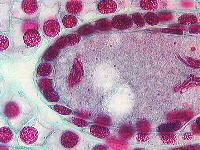 The nucleolus, tightly appressed to the nuclear envelope of the megasporocyte, forms a nucleolar cap. 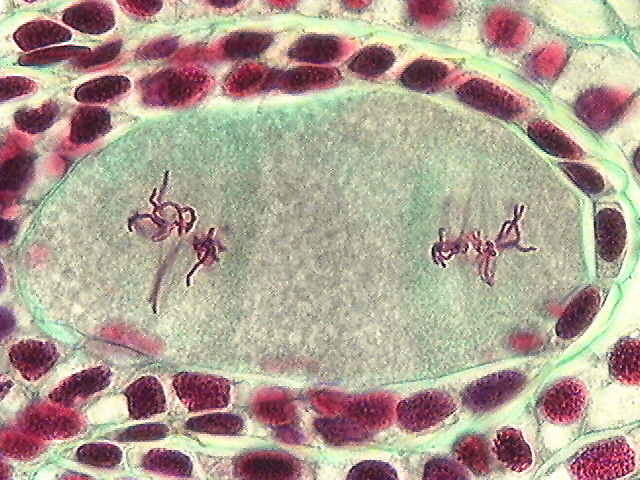 Chromosomes are paired at this stage (near pachytene) during crossing-over. 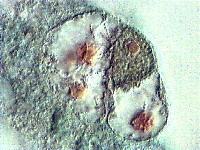 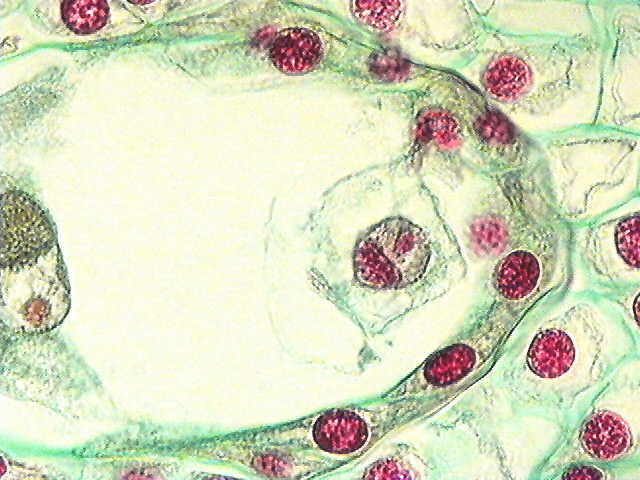 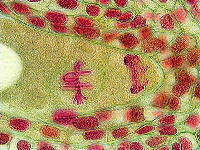 Telophase I in the megasporocyte. 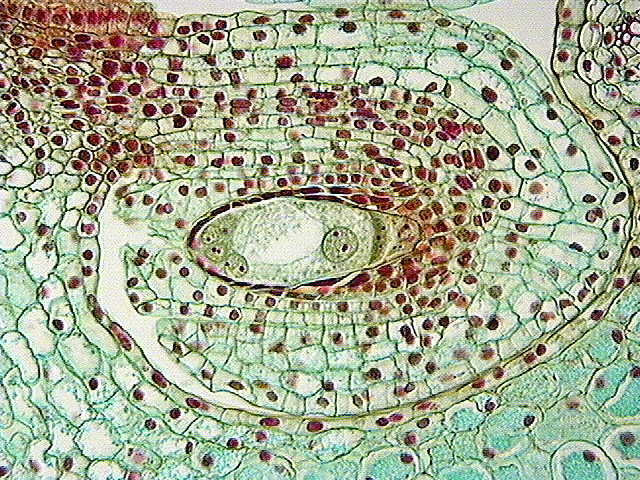 The nuclear envelopes frequently reform in monocots. 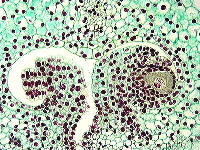 The phragmoplast located between the dyad nuclei will disperse without forming a cell wall. 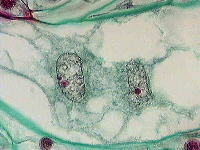 Dyad nuclei dividing: Metaphase II. 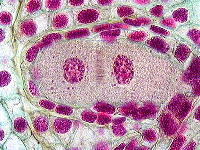 The two dyad nuclei form a transverse spindle during the second half of meiosis. 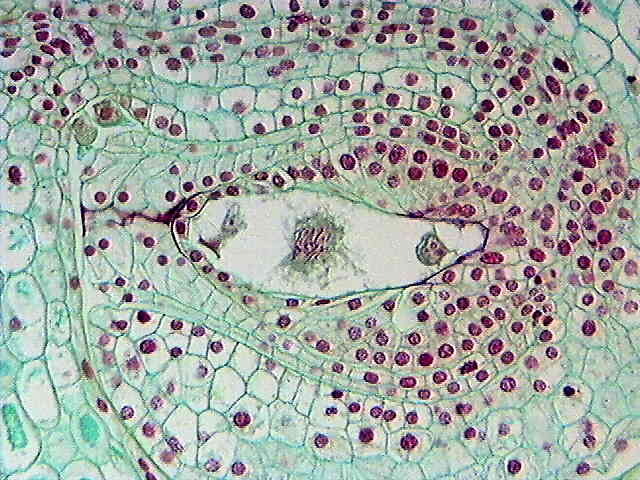 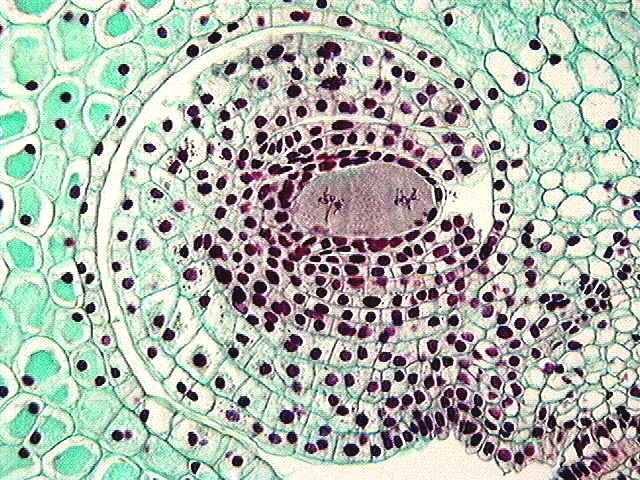 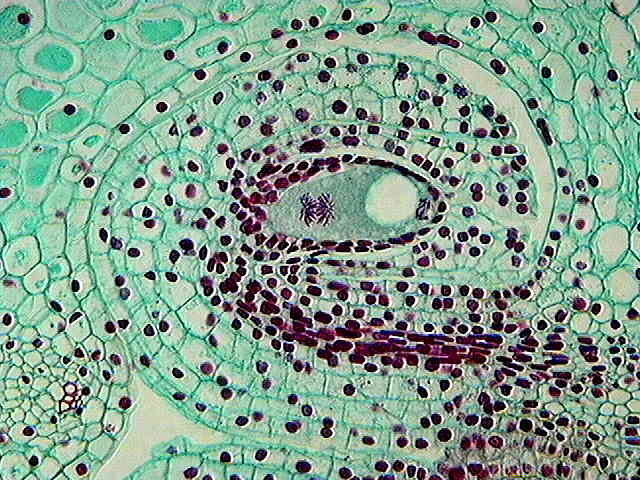 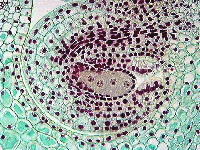 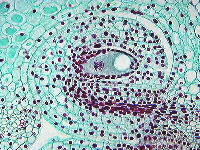 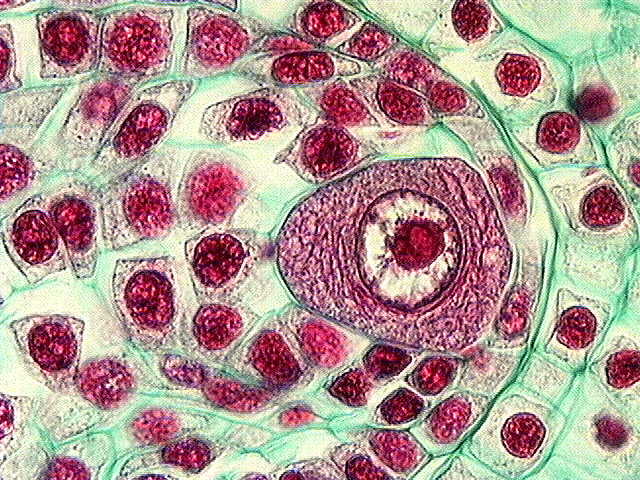 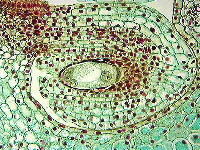 At the conclusion of meiosis, there are four equal megaspore nuclei formed in lily. 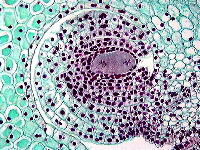 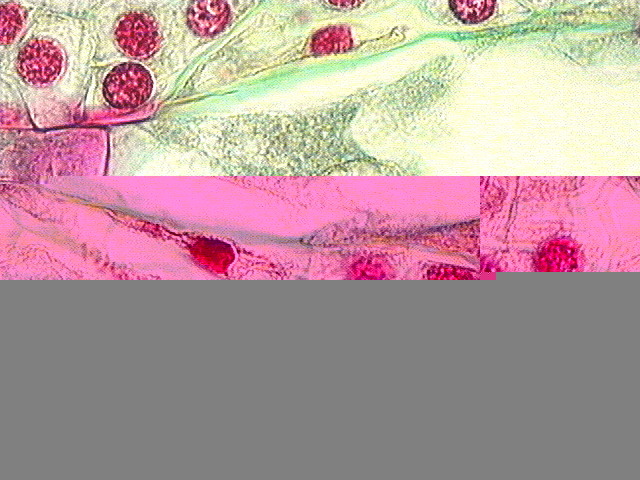 Since all four megaspore nuclei persist and contribute to the forming embryo sac, this is tetrasporic. 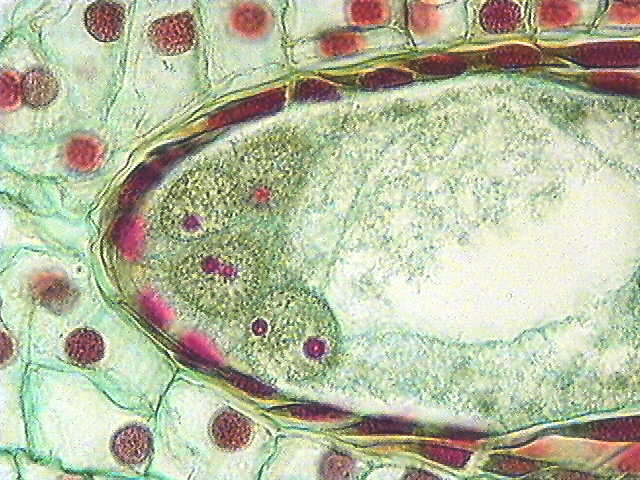 Soon after their formation, three of the megaspore nuclei migrate to the chalazal end, while one remains in the micropylar end. 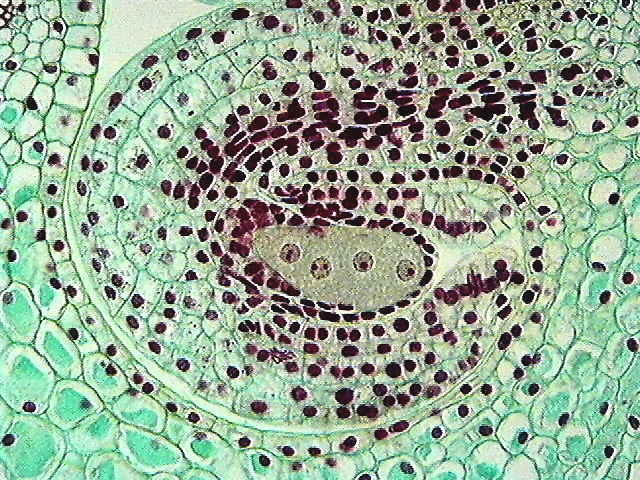 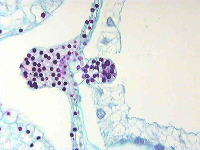 As this occurs, a central vacuole enlarges. Preparation for first mitotic division. 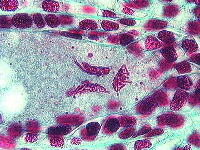 The micropylar and chalazal chromosomes condense prior to mitotic division. The micropylar end of the embryo sac will contain two 1N nuclei. The chalazal cluster becomes part of a common mitotic spindle and will reconstitute two 3N nuclei after the completion of mitosis. 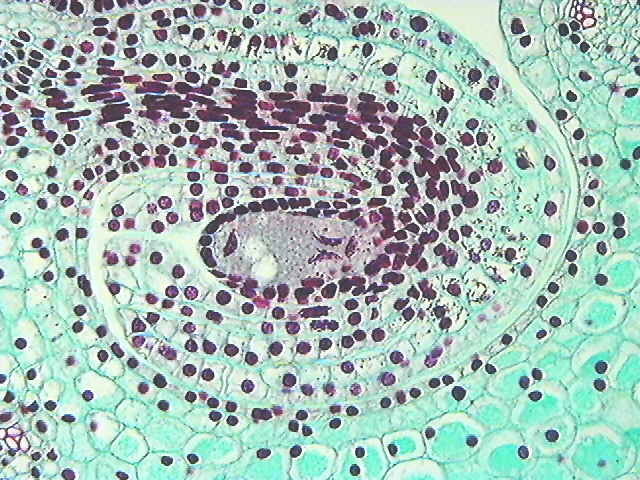 Ultimately, the mitotic assemble in the embryo sac form traditional spindles. The chromosomes in the chalazal end outnumber the micropylar ones by a 3:1 ratio. 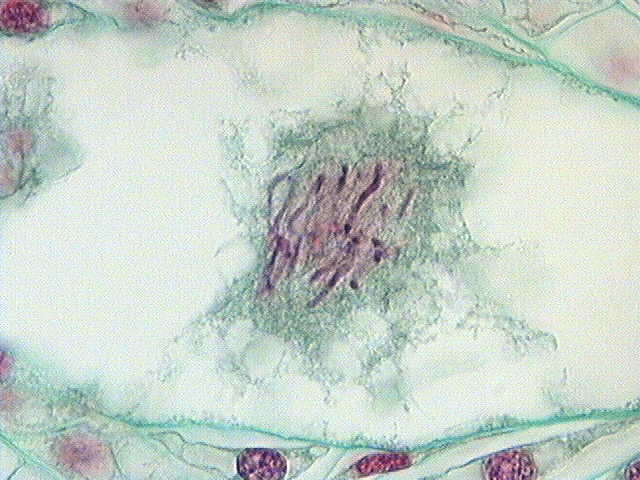 The micropylar nuclei develop spindles with perpendicular nuclei. 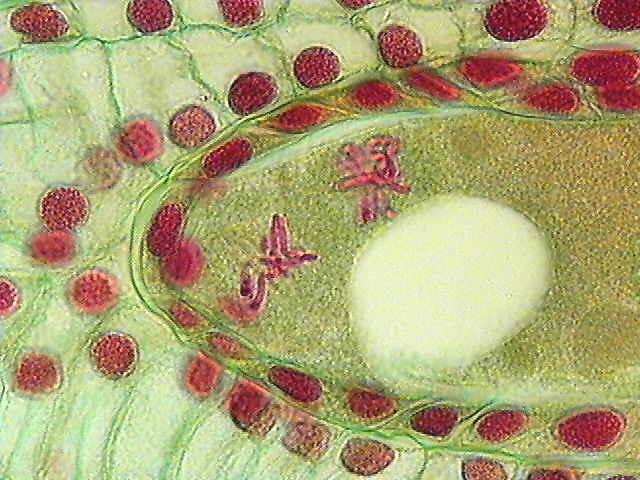 The micropylar spindle is located transversely and will form the two synergids, while the more chalazal spindle of the two is at right angles and will form the egg and a polar nucleus. 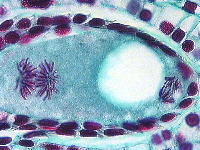 Among the chalazal products of mitosis, the spindles are also oriented perpendicular to one another. 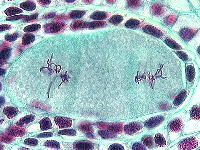 The chalazal of the two spindles is poorly formed, whereas the more central of the two spindles will form a polar nucleus and one antipodal. The four micropylar nuclei are all haploid (1N) nuclei that will form the egg, two synergids and one of the two polar nuclei. 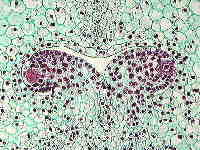 The large chalazal nucleus is the 3N polar nucleus. 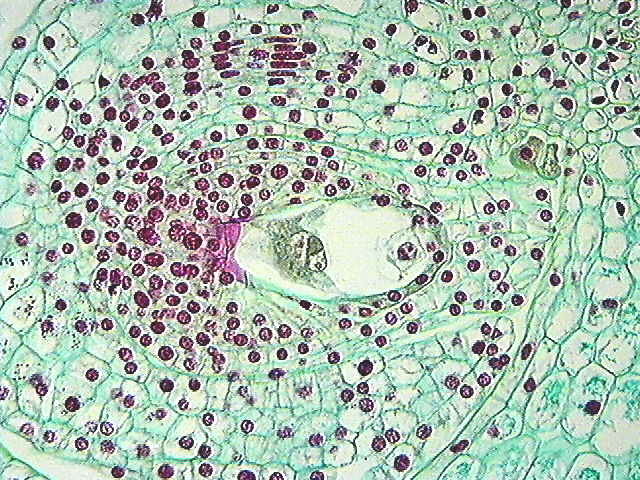 The adjacent cell is a 3N antipodal cell. 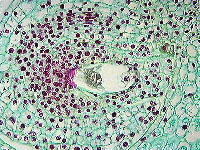 Chalazal to this is another antipodal cell. 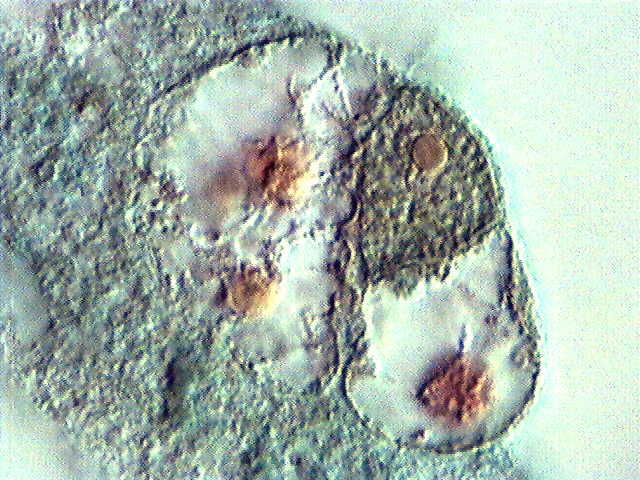 Since the two chalazal nuclei never complete mitosis, only one cell (potentially 6N) is formed instead of two. 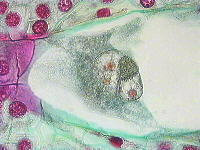 The micropylar end of the embryo sac (to the right) contains a dense male nucleus and a less dense female nucleus, which will fuse to form the zygote. The chalazal end of the embryo sac contains the fusing polar nuclei, which are less dense, with the darker male nucleus. 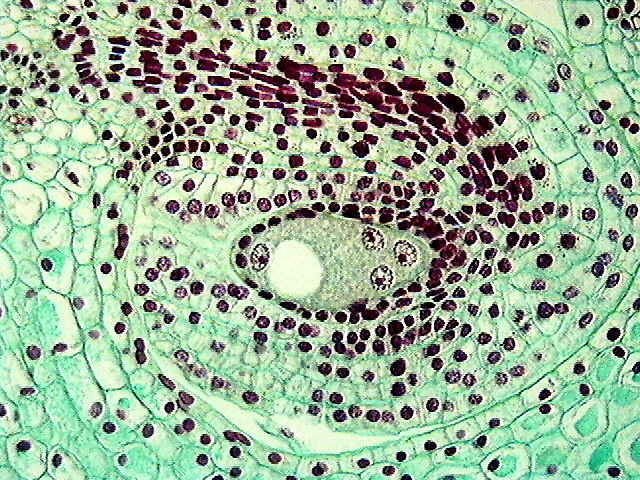 This product of triple fusion forms a 5N endosperm (1N + 1N + 3N). 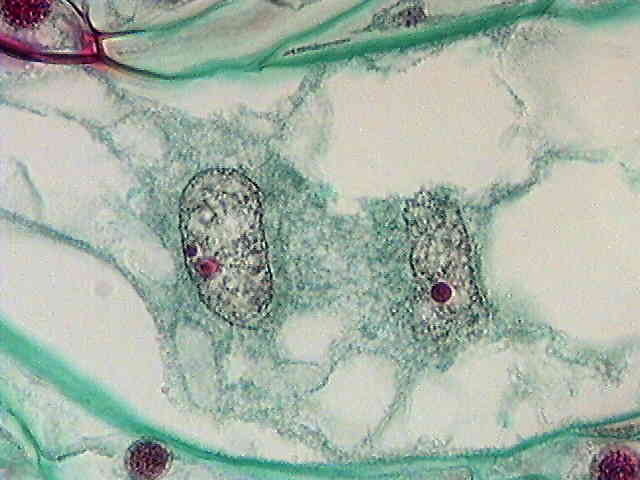 The nucleus to the left is the 3N (formerly chalazal) polar nucleus. 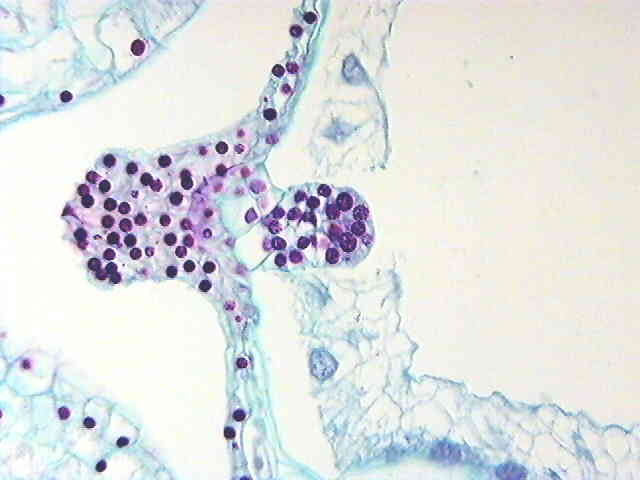 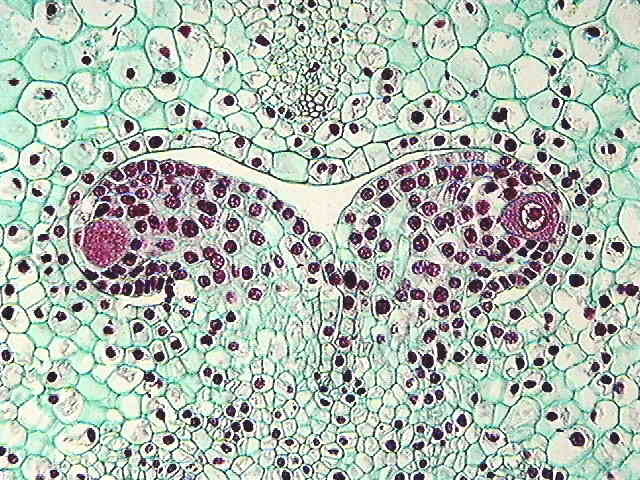 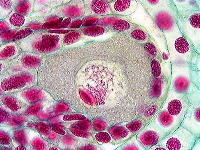 In the center is the male (sperm) nucleus. 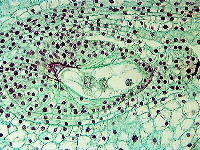 On the right side is the 1N (formerly micropylar) polar nucleus. 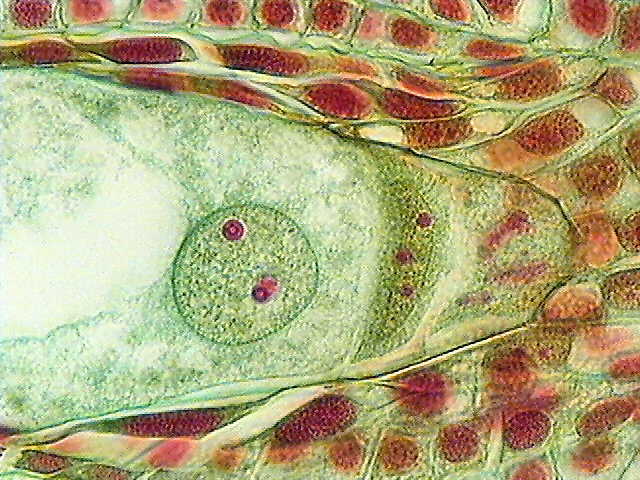 The endosperm begins to divide prior to the division of the zygote is shown to the right. 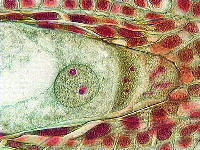 The embryo proper forms a globular stage early in its development. 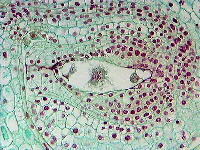 The basal area of the embryo is to the left; the globular proembryo to the right.